Robert Grover is a living legend in cardiovascular pulmonary research. He and his first wife Estelle conducted research in the highest places on three continents. In his Denver lab, he trained many of today's leading researchers. Read about the scientist outside the laboratory, from Colorado cabin to Mount Everest. Robert Grover is a living legend in cardiovascular pulmonary research. The first Grover Conference in 1984, the Estelle Grover Lecture, and the annual Robert F. Grover Prize are just a few examples of why so many of us know Bob’s name and his many contributions over the years. But few of us actually know the real man behind the famous name—until now, thanks to Elise, his wife and now his official biographer, in Always a Quest. With his first wife and research partner, Estelle, Bob conducted research in the highest places in on three continents. Together they climbed mountains to study the effects of high altitude on the heart and lungs. In the Himalayas, they provided medical care to overzealous Mount Everest climbers. In the Andes, they studied the dust-filled lungs of Bolivian miners who worked in Potosí, the world’s largest silver mine. The Grovers settled in Denver and established the Cardiovascular Pulmonary Research Laboratory at the University of Colorado, where Bob trained many of today’s leading scientists in the field. His life story reveals how inspiration, combined with focus and dedication, will overcome challenges and lead to amazing achievements. An enthusiastic recommendation of Always a Quest by Elise Waalen. The story of my friend Dr. Bob Grover and the team he assembled in Denver’s legendary CVP lab is a must-read account that will inspire cardiopulmonary researchers and clinicians alike. From building their own research tools to corralling cattle for high altitude studies, the story inspires all who are interested in research and discovery. Elise Wäälen does a masterful job of telling the stories of the people that were Bob’s colleagues, trainees and friends. The human capitol that emerged from CVP is as much Dr. Grover’s legacy as his discoveries in the field of pulmonary hypertension, brisket disease and high-altitude disease. A great read for all who aspire to run a research laboratory. "Always a Quest" is the biography of Bob Grover, scientist, leader and visionary. He conceived the idea of a Cardio-Pulmonary Research Laboratory at the University of Colorado in Denver and recruited an amazing faculty team; impressive not only in terms of scientific talent but also because of their colorful personalities. The book is beautifully written by his wife, Elise, in a fresh, engaging and accessible style. You can feel the apprehension in the conference room with the fellows waiting to be grilled on their research experiments and in the corral in the mountains with the cattle and sheep waiting to be studied. Bob's mentorship in the area of pulmonary hypertension is legendary. Many of his scientific children and grandchildren lead the field today around the world. Part of his legacy is the outstanding series of Grover Conferences on the pulmonary circulation. The 18th of these was held in 2017 in the mountains of Colorado. With this book the quest is complete. Bob Grover is a legend in the field of lung vascular physiology and pathopohysiology, and this book shows the man behind the legend. He travels the world with his research partner and wife, Estelle. Together, they discovered the fundamental ways by which high altitude hypoxia causes pulmonary hypertension for people living and working in the highest mountains in the world. The book will inspire anyone who is inquisitive and ambitious, especially physicians and research scientists. The author, Bob’s current wife, Elise, shows how Bob was successful in setting up the Cardio Vascular Pulmonary Research Lab at the University of Colorado on a shoestring budget. His lab trained many of today’s leaders in the field; and this lab continues investigate the causes of pulmonary vascular disease. 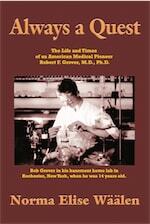 "Always a Quest" offers a glimpse into the remarkable life of Dr. Robert Grover. Dr. Grover's curiosity led to incredible discoveries, including insight into how the heart and lungs respond to environmental stressors like high altitude. He left an indelible mark on the field, and on the many generations of medical scientists who have followed him. Norma Elise Waalen is a storyteller. He grandfather was a doctor and the respected, recognized storyteller of Lillehammer, Norway. Whether it is fiction or non-fiction, Elise strives to give the reader insight into the humanity of the characters who populate her work. From little vignettes a fully developed story unfolds as in the case of Always A Quest. What started out to be the telling of the beautiful love story of Bob and Estelle Grover, evolved into the biography of Dr. Grover and the remarkable life he has led. Now known as Elise Grover, she lives on the Central Coast of California with her two best friends, her husband Bob and Jasmine, their cat.